Virgin Atlantic has disclosed that it is actively studying a replacement aircraft that can single handedly replace its large wide bodied fleet of Airbus A340-600s and Boeing 747-400s. This is due to the fact that the airline is now doing a U Turn on its famous marketing premise "4 engines 4 Long Haul" because of high fuel costs associated with operating such type aircraft. Their CEO has stated that "the airline is rapidly moving out of four-engined aircraft - we have to do that because of where we seeing fuel costs going". Currently pending on order, VS has 6 A380s (deferred till 2017 and ordered in 2001) + 15 B789s (plus another 8 options) + 1 A333 (7 already delivered). Its high density fleet today consists of 18 A346s (308 seat configuration) + 13 B744s (367-455 seat configuration depending on 2 or 3 class layout) respectively. One condition of VS is that the delivery time frame of the replacement aircraft that it is studying has to be within the next 3-5 years in order to save on fuel related operational costs. 1. The A351 (A350-1000X) EIS is now delayed as everyone is aware of plus it has had many cancellations due to its original design and performance threshold not meeting customer's expectations. This aircraft variant is expected to arrive in 2017 i.e. 5 years from now and for a new customer, earliest delivery slot would be in 2019 which is too late for VS as they want 2 engined long haul aircraft faster due to the soaring fuel costs as clearly mentioned in their press release. In addition, amongst the A350 family currently, this aircraft type is the least popular as only 62 have been ordered! 2. The largest B787 variant i.e B787-1000 is not an A346/B744 sized aircraft to be an effective replacement. It is meant to replace B772ERs, A333s and A343s! 3. The A359 is too small to replace their B744 and A346 fleet however the B77W (B773ER) is the best bet as if ordered this winter, it can be delivered from 2015 onwards gradually. Its high density 2 class configuration for its leisure flights out of LGW and MAN are ideal as well as its 3 class capacity carrying capability out of LHR. VS's Aussie franchise VA already has experience with the B77W so they can be a lot of expertise and cross synergies gained/transferred over by ordering the B77W as a pure B744/A346 replacement. 4. In addition, Boeing can also help structure a deal where by VS becomes one of its launch customers for the newly proposed B777-900X which has an EIS of 2021. This can be done by Boeing placing with VS as a " stop gap bridging solution" 30+ new B77Ws (delivery from 2015 onwards) in exchange for a similar sized launch order for the B779X. Once the B779Xs get delivered frame by frame to VS, they will return back to Boeing the B77Ws which can be sold or leased to another carrier as in 2021-22 these aircraft would still have good resale value as they would be only 6-7 years old. The B779X aircraft type is expected to yield a 21% improvement in per-seat fuel burn and a 16% improvement a cash operating cost per-seat over today's B77W hence if proven true it is a a win-win deal for both parties. VS can too take advantage of many launch customer financial discounts that Boeing provides to airlines who are launch customers. 5. As far as its A380 order (6 frames) is concerned, it was placed in 2001 and since 2004 been regularly deferred till 2017. One does feel that the A380 is now not a good fit for VS but all is not lost, as Airbus can easily offer them an exchange i.e. 1.5 or 2 A333s for each A380 ordered. In turn, this would result in VS gaining an additional 12-15 A333s in its fleet which is more suited for its worldwide network as the carrier relies more on frequency rather than capacity. With the A333IGW now available, this aircraft can easily fly nonstop from LHR to SFO/YVR/LAX/DEL so a benefit indeed for VS. 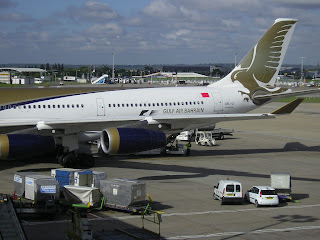 The A333IGW is also capable enough and perfectly sized to launch planned new nonstop routes in 2013/14 which are BLR, IAH, GRU and GIG. FYI, VS's current A333s seat 266 passengers in a 3 class configuration. Singapore Airlines has officially announced that it has placed a multi billion dollar order with Airbus towards a purchase of 25 additional wide bodied aircraft designed for expansion and replacement of some of its current fleet. The total order worth is US$ 7.5 billion and consists of 5 Airbus A380s + 20 more A350-900s. In addition, SQ too confirmed that due to soaring fuel prices and changed market dynamics, it shall be suspending two of the world's longest nonstop flights from its SIN hub to EWR-Newark and LAX respectively which are currently operated on a daily basis using an Airbus A340-500. Both these routes will see their nonstop flights grounded effective 27OCT 2013 and in exchange for this mega order, Airbus has agreed to take back SQs entire fleet for A345s. With regards to the 20 B787-900s that SQ has on order with Boeing, it has now revealed that all of these aircraft shall be transferred to its long haul low cost subsidiary i.e. Scoot and also it wont be for the -900 version. Instead, SQ is working with Boeing in having a mixed fleet of the smallest B787-800s and the largest B787-1000s in its fleet in order to adequately serve markets depending on their individual demand characteristics. Interesting barter deal exchange done by Airbus with SQ with regards to taking back their A345s. This is similar to what Boeing did with SQ in the early part of the previous decade when it bought SQs A343s in exchange for a large B777 order from the airline. Other airlines plagued with operating A345s such as TG and EY must be surely licking their lips now knowing what can be possible in the future with their own small fleet of A345s when negotiating an Airbus order. 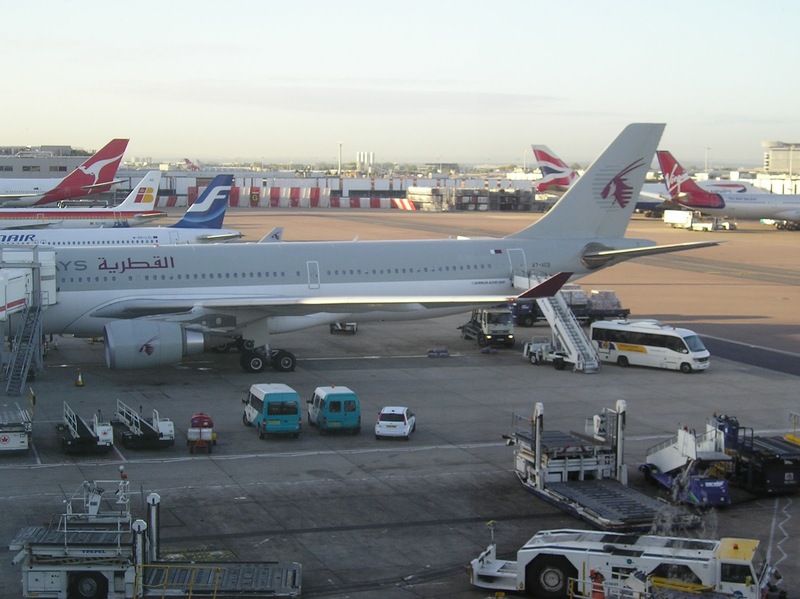 Qatar Airways has officially revealed that it shall be launching new flights to Phnom Penh, Cambodia effective 20FEB 2013 as the carrier looks to take advantage of the rapidly growing tourism traffic originating from Europe into this country. QR shall operate a daily 259 seater A330-200 to PNH via SGN (Ho Chi Minh City) with three flights departing DOH at 0115 and the remaining 4 at 0730. The routing shall be DOH-SGN-PNH-SGN-DOH with 5th freedom traffic rights available on SGN-PNH-SGN. QR also announced that its current services to CGK-Jakarta, Indonesia shall be increased effective 09FEB 2013 as the carrier will be adding an additional 11th weekly nonstop flight on this route using an A332. Lastly, QR's CEO has officially disclosed that in 2013, QR shall be launching 16 new destinations of which in USA there shall be 4 i.e. Chicago (already announced) along with Detroit, Boston and Atlanta. The latter 3 are expected to be operated with the B787-800s. Very surprising to see ATL on this list and not MIA/DFW especially since there is no hint of any relationship developing with Delta. Both MIA and DFW offer much larger O&D market sizes to GCC, Indian Subcontinent and Africa versus ATL + better connection possibilities with both airports being core AA hubs. BOS shall do well for QR as it has a code share deal with B6 that has a hub out of BOS + AA too maintains a decently sized hub base there. AB will be code sharing with both AA and EY on this new service! Good choice of launching ORD-DUS as AA is very weak in Germany and now with AB in One World, this new route should help elevate its market foot print in Germany and Eastern Europe. DFW-ICN is an interesting choice given that KE already operate this sector nonstop. If the B787-900 or B 777-300ER can operate DFW-PEK/PVG nonstop without any payload limitations in either directions, then either route should be seriously considered for the future as there is a lot of potential to be exploited here. Korean Air has announced that it will be launching new nonstop flights to Saudi Arabia effective 09NOV 2012. Three weekly triangular routed flights shall be flown using an Airbus A330-200 as Seoul-Riyadh-Jeddah and is designed to link the two Sky Team hub airports with each other to enhance network connection options. In addition, due to the massive influx of Korean construction and engineering personnel flying back and forth between South Korea and Saudi Arabia. Over the past one year, passenger movement combined between RUH + JED to/from ICN was 37,000 passengers. Turkish Airlines has officially revealed that it has signed a contract with Airbus to purchase 15 additional Airbus A330-300s that shall be delivered from 2014 onwards. These aircraft will be the A333IGW version which is capable of operating nonstop to Toronto, China, Hong Kong and Seoul from its Istanbul hub base. TK too is expected to announce another order for a dozen more Boeing 777-300ERs to further fuel its long haul expansion. With this additional order, TKs A330 fleet stands at 27 A 333s + 7 A332s. ONE WORLD has officially announced at its head quarters in New York City, that it has invited Qatar Airways to join the alliance which the mega Gulf carrier has willingly accepted. With this move, QR becomes the first amongst the Big 3 GCC carriers to join a major alliance. QR currently serves a majority of the key One World hub airports with a minimum daily frequency such as JFK (daily), LHR (5 daily), HKG (double daily), AMM (daily), CMB (triple daily), MEL (daily), NRT (daily) and soon ORD daily. One World needs a solid Africa presence as well and unfortunately for them all the viable carriers are part of an alliance now from that continent. India too is a market that needs to be looked at again with Air India as a partner as they will gain massive political leverage in India if this comes through positively. In addition, they shall benefit as AI flies into all the major OW hubs such as HKG, LHR, JFK, ORD, NRT, DOH, CMB and soon SYD so a no brainer there. AI-AA can code share on DEL-ORD and JFK-DEL/BOM. AI-QF can code share on AI's soon to be launched B787 nonstop service to SYD/MEL and in turn AI can code share on QF via Australia to AKL/CHC + domestic Australia services to PER/ADL/BNE etc. BA-AI can code share on UK-India + domestically within each country + AI can code share on trans-atlantic services via LHR to USA operated by AA/BA. JL-AI can code share on all Japan-India flights + domestically within their own respective countries + AI can code share on trans-pacific routes via NRT on JAL. With regards to QR-AI, QR can code share on domestic India where as the main benefit for AI with QR is to code share on DOH-Africa and DOH-Levant/Iraq/Iran services. Alaskan Airlines has officially announced that it has placed its largest ever single aircraft order with Boeing earlier on this week for 50 Boeing 737s which shall in turn gradually replace its entire current fleet of B737-300/400 Classics as well its oldest B737NG models. The breakdown of the order was for 13 Boeing 737-900ERs + 20 Boeing 737-800Max's + 17 Boeing 737-900Max's. Air India has officially announced that due to lack of bids from airlines desiring to dry and wet lease its fleet of 5 Boeing 777-200LRs, it will be putting up these aircraft for sale effective November 2012 as the carrier now has no use for them. Out of its fleet of 8 B77Ls, it will keep only 3 to be used exclusively on its popular BOM-EWR nonstop services. Airlines that currently operate the B77L today are EK, AC, DL, PK and QR only. With regards to which airlines would be interested, one has to first look into the configuration of these airlines operating a fleet of B77Ls versus AI. The latter operates a 3 class B77L which out of the current operators only EK does whilst QR/AC/DL all operate 2 class versions. Now in an ideal world, due to its rapid growth strategy, QR would be the hands on favorite to purchase these 5 birds however knowing what a tough bargainer Mr Baker is, he would only purchase it if AI pays for the cabin reconfiguration as well as per his current B77L 2 class product standards. It would be very difficult for AI to sell these birds as a 3 class aircraft unless it reduces the price further to take into account the other airline's re-configuration cost ! Two other airlines which could be a dark horse contender and that too would probably take it in the current AI configuration are Saudia Airlines and Kuwait Airways. With regards to SV, they have officially announced that they are in 2013/14 going to be embarking on a major long haul expansion program hence these 5 B77Ls would be ideal to launch 3 weekly Toronto + increase JFK to a daily service and IAD to at least 4 times per week from JED/RUH. As far as KU is concerned, one does not need to look any further to realize that this airline's fleet (except for the A320s) needs a total makeover due to the unfortunate mechanical aging state that it is in. KU can use the B77Ls to operate to JFK on a daily basis nonstop versus the current 3 weekly nonstop + 3 weekly via LHR combination which would take up 2.5 aircraft + use 1 dedicated for KWI-LHR daily + the other two on its FRA/CDG/FCO services replacing the AB6s! KU not only needs a fleet make over but also a major on board product face lift which as a stop gap measure these AI B77Ls will help provide. Garuda Indonesia and Etihad Airways have officially announced a major code sharing joint venture that will see the airlines feeding each other's hubs with connecting traffic marketed by both carriers alike. It will be valid effective 02DEC when GA transfers its existing 4 weekly CGK-DXB-AMS service to operate via AUH using an A330-200. In turn, EY will code share on GA's AUH-AMS service + GA will code share via AUH to all of EY's European, GCC, North America and MENA destinations. GA is part of Sky Team and with the recent EY-AF-KL 3 way deal being announced plus last month AZ-EY plus EY wanting Air Berlin to be aligned with Air France, one can easily make out the new focus of EY's alliance strategy. 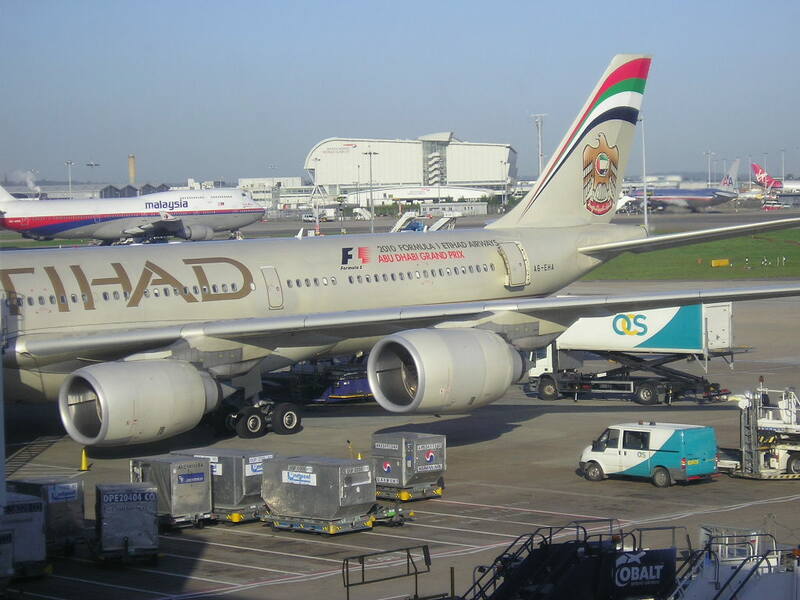 Etihad Airways has disclosed on the GDS system that it will be increasing capacity on its AUH-SYD services as the carrier shuffles around its newly delivered 3 class configured Boeing 777-300ERs between its two flagship routes of London and Sydney respectively. Effective 31JAN, out of its current 11 weekly flights to SYD all operated with an A346, a total of 7 shall be flown using a B773ER (seats 38 pax more versus A346) and in turn, LHR capacity gets reduced from triple daily B773ER to double daily B773ER + daily A346. The Kingdom of Saudi Arabia has officially announced that it has signed a new more liberalized bilateral accord with both Kuwait and Philippines allowing more flights to be operated between the two countries. *All above mentioned flights to be operated with a mixture of B738s and B739s. As far as 9W's B777-300ERs are concerned, they have also been reconfigured to boost the capacity in the economy class cabin in particular with a 4th seat added in the middle row similar to EK/KL/EY. The new cabin layout thus will have 34 more seats in economy class (total 308) and the total on board capacity will as a result increase from 312 to 346 (8F/30J/308Y). The new daily flights for both CGK and MNL will be departing DXB between 1830-1900 and arriving back by 1300 UAE time. 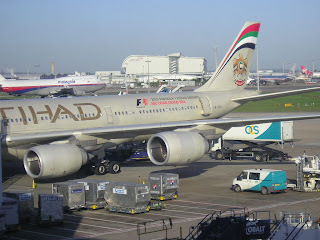 Etihad Airways has announced that due to increasing demand for its Istanbul bound services, it shall be increasing frequencies on the route effective 30DEC 2012 onwards. Currently, EY operates 5 times per week between AUH and IST using an A320, these shall be increased to a daily nonstop flight using a standardized schedule with the same aircraft type. SAS has disclosed that after an operating period of 63 long years, it has reached a critical stage where it sadly announces that it shall be suspending all of its flights to BKK-Bangkok, Thailand effective 07APR 2012. 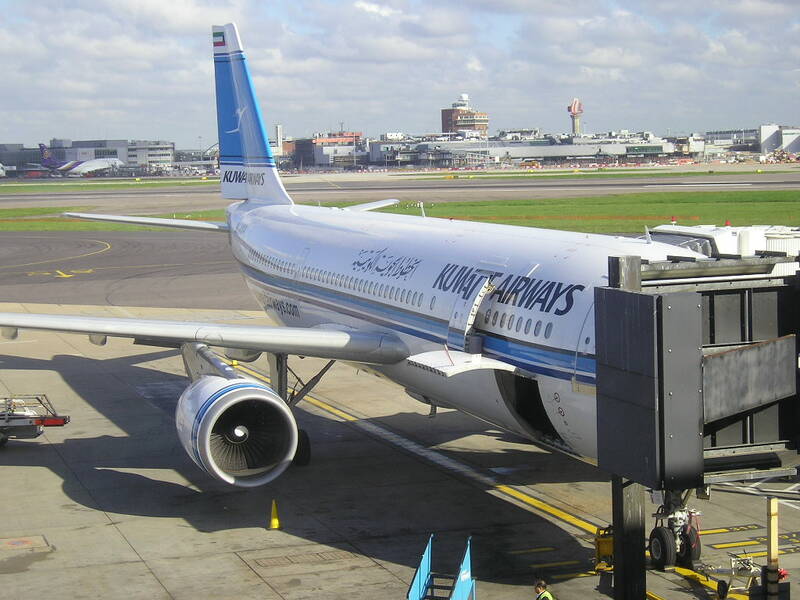 SAS currently operates a daily nonstop service from Copenhagen to Bangkok using an Airbus A 340-300. It has been effected with the growth of Gulf Air, Qatar Airways, Turkish and Emirates eating into its market share on the CPH-BKK sector. SK will however continue to code share on this sector with Thai Airways who are increasing its own CPH services from daily to 9 times per week effective 28OCT12. 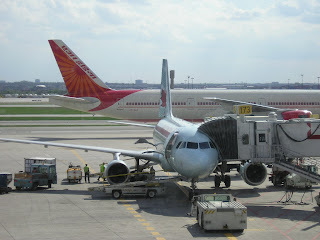 Air India has revealed on the GDS that it will be reinstating its flights to YYZ-Toronto effective 10MAR 2013. These flights will return to its original schedule of operating a daily nonstop service using a Boeing 777-300ER. Flights are timed to arrive into YYZ at 0815 and depart at 1550 daily respectively. i. Return nonstop to YYZ but with a 4 weekly nonstop service only between 01MAR and 15OCT. Increase to daily from 15OCT 2013 onwards only when the peak season for travel to/from India begins on this route. ii. If there is a need to return to YYZ on a daily basis using a B773ER, then it should be a one stop service operated via Manchester for the simple reason that DEL-MAN has a O&D market size of 52,000 pax per year with no nonstop service and the same applies to MAN-YYZ which has a O&D market size of 20,000 with no scheduled carrier operating it nonstop. The MAN-India market size is much larger than BHX-India and also higher yielding. 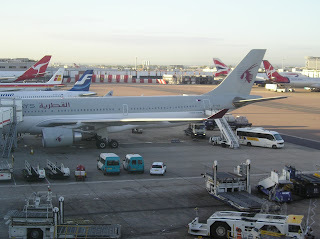 The BHX-India market size in 2011 was 157,000 passengers versus MAN-India which was 226,000 i.e. 44% higher ! In addition, via DEL, AI can carry passengers to DAC, BKK, CMB, KTM, Australia and SE Asia which also MAN has a bigger market size demand versus BHX! Operating a DEL-MAN-YYZ is a safe year round option which is guaranteed to see 80-85% S/F along with high cargo loads. ANA of Japan has made a major fleet order announcement for its long haul network by announcing a deal with Boeing for 11 additional Boeing 787-900s. These B789s are the long term replacement for its B772ER and B763ER fleet. One of its new routes i.e. Tokyo-San Jose nonstop shall be operated with the B787 from January 2013 onwards. In total, 30 B789s have now been ordered by ANA. Philippine Airlines has announced that it has placed another major order with Airbus to further boost its long haul ambitions especially in light of the recently liberalized bilateral accord with UAE and Saudi Arabia. A total of 10 additional A330-300IGWs have been ordered by PAL in addition to the original 10 that it had placed two weeks ago. This brings a total of 20 A333IGWs ordered by PAL of which it has officially disclosed that a size able number shall be used to relaunch nonstop flights from its Manila hub to the Middle East region. Qatar Airways has officially announced that it will be launching a new 4 weekly nonstop service to NJF-Najaf, Iraq effective 23JAN 2013. All flights shall be operated with an Airbus A320 departing DOH twice a week at 0915 and 1315 each respectively thus allowing all of its markets to be connected via DOH conveniently at least twice a week. QR's main target markets to NJF are DMM, BAH, BOM, KHI, MCT, KWI, LHE, DXB and DOH respectively. Malaysia Airlines has disclosed on the GDS system that it will be massively increasing capacity on its European bound services to London and Paris respectively from 24NOV respectively. 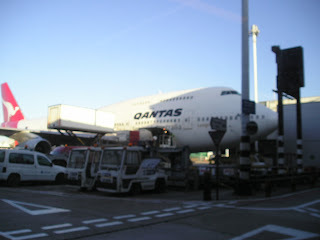 Flights to LHR shall receive a capacity boost with double daily A380s being deployed versus a daily B744 + daily A380. 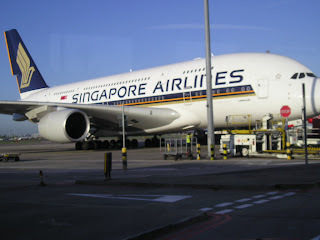 As far as CDG is concerned, capacity shall be increased from a daily B772ER to a daily A380 effective 02MAR 2013 respectively. Open skies accord signed between UAE and Philippines for all points except Manila. With regards to Manila, a total of 56 flights between the two countries can be operated per week. Both Emirates and Etihad Airways are allowed to increase their current double daily B777 operated services to MNL to 4 times daily each respectively maximum. Both PAL and Cebu Pacific are the designated carriers from the Philippines and have already officially confirmed their intentions to launch nonstop MNL-UAE flights from W13 using their newly ordered A333IGWs. Qantas Airways has officially announced that it has signed a landmark 10 year commercial alliance agreement with its former arch-rival i.e. Emirates that will come into effect 31MAR 2013 i.e. on set of the IATA S13 season. Qantas of Australia has officially announced that due to its heavy losses incurred in 2011 on its international routes solely totaling US$ 450 million it has canceled a previously confirmed order for 35 new Boeing 787-900s with the American manufacturer. Boeing and Qantas have a long business relationship and both sides agreed to help each other out during a time of crisis as Boeing too requires B789 slots being freed for current clients due to the aircraft sales popularity versus the -800 version. China Southern Airlines based out of Guangzhou has officially announced that its first international route operated by its Airbus A380s will be LAX-Los Angeles, USA effective 12OCT 2012. Capacity will be increased on this sector from a daily B772ER offering 282 seats to a daily A380 offering 506 seats in a 3 class configuration seating 8F + 70J + 428Y class passengers. According to world famous airplane photographer and traveller, Mr Sam Chui, CZ’s on board chinese cuisine on its international flights are the best in the world to sample! CZ’s CEO has also announced that its second A380 route shall be to London Heathrow from Summer 2013 as the carrier looks to penetrate the Australia-LON market segment in particular with this aircraft type. Following in the footsteps of Gulf Air and British Airways, American Airlines has now officially announced that they will be the 3rd airline in the world to be installing a flat bed business class product on their new Airbus A321 fleet. AA’s A321s will have two configurations i.e. one exclusively for trans-continental nonstop flights from its JFK hub to SFO and LAX and others in a regional configuration. The premium A321 configuration will have a total of 102 seats on board with 30 flat bed seats (10 first class + 20 business class) along with 72 in economy class. All seats in F and J class cabins will be flat beds + have personal tv screens installed. In total, AA’s premium configured A321s will be operating 10 daily JFK-LAX + 5 daily JFK-SFO nonstop services. Qatar Airways has officially announced that it shall be significantly increasing capacity to ICN-Seoul, South Korea from the on set of the IATA W12 season. Currently, QR operates a daily nonstop service from its DOH hub into ICN using a 2 class configured Airbus A330-200 seating 257 passengers. Effective 28OCT 2012, all flights shall be upgraded to the 335 seater Boeing 777-300ER thus representing a capacity increase of 30% as well enabling the carrier to carry an extra 6 tons of cargo per flight. Shaheen Air of Pakistan has officially announced that it will be embarking on a major route network expansion with a modern fleet of both wide body and narrow body aircraft which shall enable it to launch more new routes rapidly. The airline confirmed signing a deal to lease 3 Airbus A330-300s seating 327 passengers + 12 Boeing 737-400s seating 164 passengers. It has already taken delivery of its first A333 and has announced its new routes which are Riyadh, Medina, Bangkok and Dhaka which shall be launched from IATA W12 season onwards. The A333s will be solely used on services to Saudi Arabia from KHI, LHE and ISB operated nonstop. Hong Kong Airlines has officially announced that it shall be suspending its flagship all business class service to LGW-London Gatwick operated nonstop from Hong Kong. The airline was the first to operate an A332 with an all J class configuration on this sector but failed to attract a healthy load of passengers on its daily service. The route was launched on 07MAR 2012 and shall be suspended effective 03SEP 2012. Finnair has officially announced that due to high demand for its services to DXB-Dubai, it shall be increasing frequencies on the HEL-DXB sector effective 13DEC 2012 onwards. Weekly flights shall be raised from 3 to 4 per week with 3 weekly B757s + 1 weekly A343s being used to operate the route. Malaysia Airlines has officially announced that it shall be increasing capacity on its popular MEL-Melbourne, Australia bound services effective 01MAR 2013. The route shall be its third Airbus A 380 operated service after London Heathrow as the carrier looks to capitalize on its One World alliance membership. Currently, MH operates a double daily A333 service on the MEL-KUL service, this will be increased to a daily A380 + daily A333 from 01MAR13 onwards. ANA of Japan has officially announced that it will be increasing its flights on its popular Tokyo-New York JFK service effective 28OCT 2012. Currently, the airline operates a daily B773ER on this route nonstop, however from 28OCT onwards it will increase to double daily nonstop using the same aircraft type. Flights will arrive into JFK at 0930/1515 and depart at 1115/1655 respectively. According to an official tender document, PIA of Pakistan will be embarking on a major fleet and network expansion overhaul as the carrier looks to be taken seriously in the international marketplace where currently its reputation has been maligned with constant delays due to maintenance related issues and union disputes with pilots. To begin with, PIA will be leasing in 4 Boeing 737-800s along with two used Boeing 777-200ERs. A couple of months ago, PIA also signed an official order for 5 additional brand new Boeing 777-300ERs with Boeing. These aircraft are slated to replace PIA’s ageing fleet of B737-300s (built in 1985) and also its last two operational B747s. South African Airways has officially announced that it will be increasing its frequencies to both Mumbai and Sao Paulo as it looks to further take advantage of its monopoly holding in both these key long haul market segments. To begin with, frequencies to BOM shall be increased from the current 5 weekly to daily nonstop flights using an A332 where as services to GRU shall also be increased from 10 to 11 weekly nonstop flights using an A332 daily and an A343 four times per week respectively. SWISS has officially announced that it will be significantly increasing its presence in the Miami marketplace during the upcoming IATA W12 season as the carrier looks to take full advantage of the massive demand to Florida out of Europe during the winter season. The Zurich based carrier will be raising the number of frequencies it operates from a daily A333 to 11 times per week nonstop with the four additional flights being flown using an A343. The 2012 Farnborough Air Show was held last week in the UK. Unlike its previous editions as well as its counterpart the Paris Air Show (which alternates with Farnborough each summer), this one failed to live up to the hype as no significant orders were placed especially for wide bodied aircraft. In addition, QR's CEO has also officially announced that the carrier will be launching new daily nonstop flights to BHX-Birmingham, UK using its new Boeing 787s in 2013. These new flights are going to be extremely popular with passengers bound to ATQ and ISB in particular. Korean Air has officially announced that it has placed an additional order for 2 new Boeing 777-300ERs which would bring its total to 16 of this type of aircraft in its fleet. KE's B77Ws are mainly used on long haul trans-pacific flights to USA and Europe respectively. Its B77Ws are configured to seat 291 pax in a 3 class layout i.e. 8F + 56J + 227Y. British Airways has officially announced that it will be significantly reducing its international operations in the Middle East region as part of the next phase of its route restructuring due to its purchase of BMI-British Midland. DMM - all flights suspended effective 16SEP. Currently, BD operates 3 weekly flights to DMM using an A332. KRT - all flights suspended effective 01OCT. RUH - frequencies reduced from 13 weekly overall (BA+BD) to daily nonstop flights using a B747-400. JED - frequencies reduced from 8 (BA+BD) to 5 weekly overall using a B767-300ER. IKA - frequencies reduced from daily to 4 weekly flights using an A321. Singapore Airlines has officially announced that it will be reducing capacity to both Milan and Barcelona for the upcoming IATA W12 season as the carrier looks to realign its Boeing 777 aircraft fleet to high demand winter routes as well as to engage in cost cutting where ever possible. Services to both BCN and MXP will be reduced from daily to 5 weekly each using a Boeing 777-300ER. Lufthansa has officially announced that it shall be suspending all flights to CGK-Jakarta, Indonesia effective 28OCT 2012. LH currently operate a daily service to CGK via SIN from its secondary Munich hub using an Airbus A 340-300. With the increasing competition to/from CGK on offer by the Middle East carriers in particular, LH feels that it is better off code sharing via SIN or BKK to CGK rather than operate its own service. 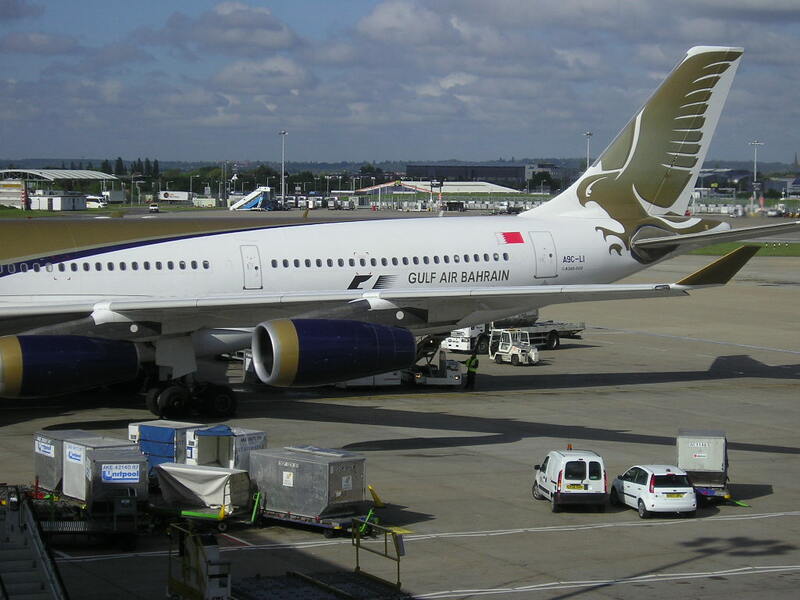 Oman Air's Board is in advanced stages of studying a proposal to add much needed capacity to its network. WY revealed that it has put forward a proposal to purchase 3 additional Airbus A 330-300s + 3 Boeing 737-800s. With 3 A333s on the drawing board, it seems very evident that further long haul expansion is on the horizon with nonstop flights to Manila in particular a firm realization in the making!. Spicejet of India has officially announced that it will be the first privately owned Indian carrier as well as the first low cost one to operate new international flights from India to Kabul effective 14AUG 2012. From this date onwards, it will be launching new 3 weekly nonstop flights from Delhi to Kabul using a 180 seater Boeing 737-800. MLE – frequencies increased from 4 to 5 weekly nonstop services using a B738. CMB – capacity increased from daily B738 to 2 weekly A333s + 5 weekly B738s. All of the above new flights depart KUL between 0900-1000 and arrive back into KUL between 1900-2000 respectively! In addition, MAS has also revealed that it is very interested to purchase a longer range A330 variant capable of operating nonstop from KUL to Western Europe with a full payload as it finds its Boeing 777-200ERs a bit too large for some of the routes. 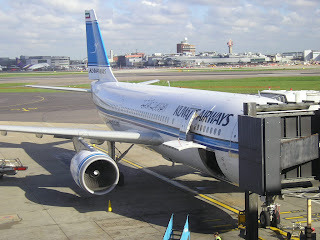 MAS need not look further than the A332IGW of which Korean Air is a launch customer for. This aircraft operates long haul flights for KE such as ICN-NBO (15 hours block time) and SEA-ICN (13 hours block time) hence for MH it can easily operate KUL-FRA and KUL-FCO nonstop which have a block time of 12 hours 45 minutes each respectively. With MH part of One World, it might be worth looking into operating KUL-DUS nonstop so that via DUS it can code share with Air Berlin to all over Central, Eastern and Western Europe. KUL-DUS block time would be approximately 13 hours 10 minutes hence operationally possible on the A332IGW. Fed Ex has officially announced that it has placed an order for 19 new Boeing 767-300ER freighters as the carrier looks to rapidly phase out its aging fleet of DC10Fs and A310Fs as they are more costlier to operate. Deliveries are expected to run between 2015-19 and it also includes converting 4 B772LR freighters previously ordered into B763ERFs !